Alex and I are now back in Metchosin, BC, where we are starting our 3rd season with Wind Whipped Farm, a small market garden business we originally launched in 2008. 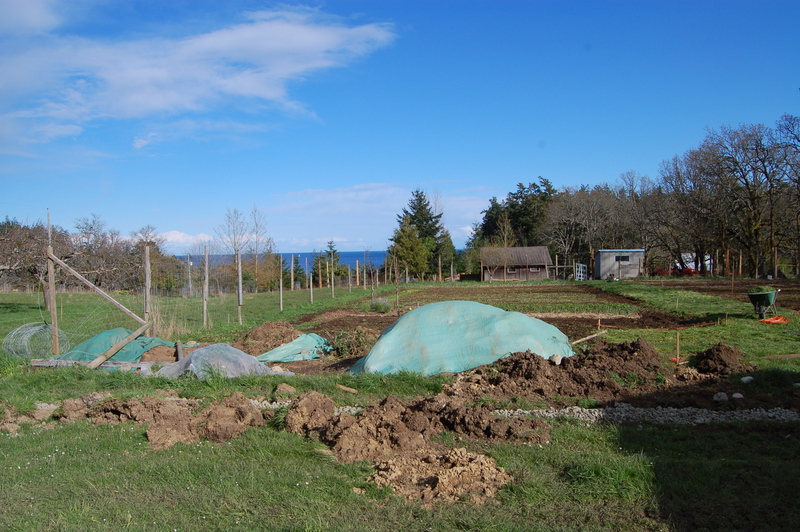 After our 2010 summer on the road biking from farm to farm, we’ve returned to Metchosin with a long list of systems and ideas we are working hard to implement and adapt to the ½ acre vegetable plot and orchard we manage. At this point, we view Wind Whipped Farm as a mid-term plan and are making investments with a 3 to 5 years payback horizon. We want to maintain a small-scale operation to allow us the flexibility to pursue other interests like going back to school, writing and becoming more involved with the National Farmers Union. On the other hand, our “small-scale” approach is already keeping us very busy! In the last few months we “re-renovated” the cabin we live in, undertook thorough crop planning (thanks to the Crop Planning Handbook published by the Canadian Organic Growers), expanded our fenced-in growing area, converted a chicken coop to a tool shed, are in the process of converting a tool-shed into a washing-shed, created our Wind Whipped Farm website and much more. 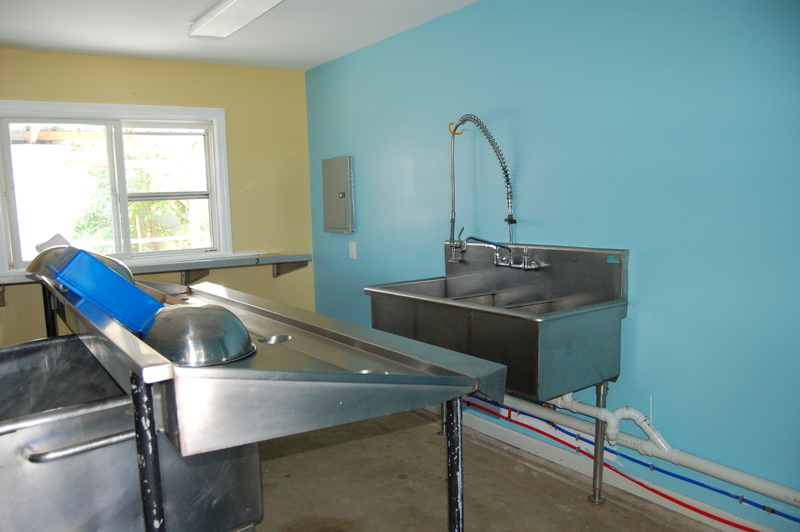 Our most exciting endeavour, however, has been the development of the Local Food Box Program. Needless to say we are in the midst of full-on marketing of this unique product. For those with connections in the Victoria area, please do spread the word as we still have boxes available. For more information on the Local Food Box Program, please check out www.windwhippedfarm.com and send any questions or comments to windwhippedfarm(at)gmail(dot)com. The Wind Whipped garden being expanded and re-fenced. So. This blog was born out of a decision by four friends–two couples–to do a bike trip together to, among other things, test out the compatibility of said couples before they started a farm together, which they were thinking about doing. At least, not in the context of a bike trip, which probably would have meant the same for a farm partnership. So, mission accomplished: better to have discovered that on a bike trip than a year into a shared farm ownership. And the four of us are still friends. And we got to see some awesome farms in the process. And my buttocks were sublime by the end of 3500 km of pedaling. So no regrets. Why bring this up? This blog is about to change gears, so to speak, and I think it’s important to explain why, and why we’ve decided to keep blogging at all. Which is this: both couples are going to stick with farming, and both want to use this blog to explore issues relevant to new farmers. Each of us will blog a bit about our respective farm businesses, and we’ll also share any decent information we encounter as we plod along. We are two couples in our mid- to late twenties who, each having spent two to four years apprenticing on and managing various organic farms, are now seeking a long-term farming opportunity together. Having recognized that outright purchase of a piece of farmland may be unfeasible, we are exploring various models, including but not limited to outright purchase, long-term leasing, transitional ownership, and cooperative farming. Our ideal farm is between five and one hundred acres, and within 90 minutes drive of a large urban centre. It features at least one large farmhouse, a sturdy barn, and room/zoning for further building construction. While collectively we have interests in orchard production, livestock, grain and dairy, we intend for our primary source of income to be derived from berries and vegetables. We will consider farmland in any part of Canada, but we have a preference for British Columbia, Ontario, Quebec, New Brunswick, and Nova Scotia. We also have a preference for complete autonomy over all farming activities, but as this is unexplored territory for us we are open to other arrangements. We look forward to speaking with anyone who is aware of an opportunity that might fit within these parameters. All inquiries can be forwarded to seeking.farmland@gmail.com. Thank you very much. Vanessa Samur, Jordan Marr, Virginie Lavallee-Picard, and Alex Fletcher. We got about forty responses, ranging from “good for you” to “You can buy my land for $500 000”. The biggest lesson learned: all the responses represented a sort of ‘put your money where your mouth is’ challenge, and it turned out we weren’t ready to do so. So we more or less passed up the opportunities that came from writing the letter, and did the bike trip instead. And yet. I’m writing this post from the cabin on the farm on which Vaness and I now reside. It’s an awesome setup that I’m about to describe, and it came as a result of the letter. Our landlords contacted us after they read it in 2009. We met them back then, told them the timing wasn’t right, but said we might be in touch if we ever came back their way looking for land. In the end that’s just what happened. For anyone else trying to figure out a way to get started, this type of setup would probably be pretty easy to find. Most farmers have a hard time finding knowledgeable, reliable labour, and often have extra land lying around. And so begins our land leasing experiment. The lease is only one year so that both parties can get to know each other; if all goes well, there will be opportunities for us to figure out something more long term in the future. For Eliot, choosing the right farming equipment and tools is key to running an efficient and successful small farm. A tool connoisseur himself, Eliot designs, collects and helps make farming tools available to the farming community. He draws his inspiration from his daily work, his travels, as well as what he refers to as his “grand-parents”- an extensive library of old agricultural books. One of the system we particularly liked is Four Season’s soil blocking and seeding method. 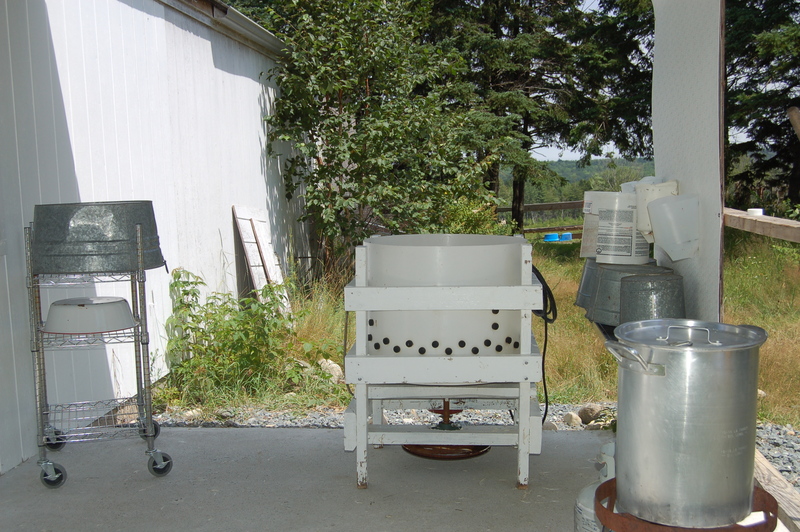 Investing in soil block makers allows to move away from using plastic containers and makes the process more time efficient. 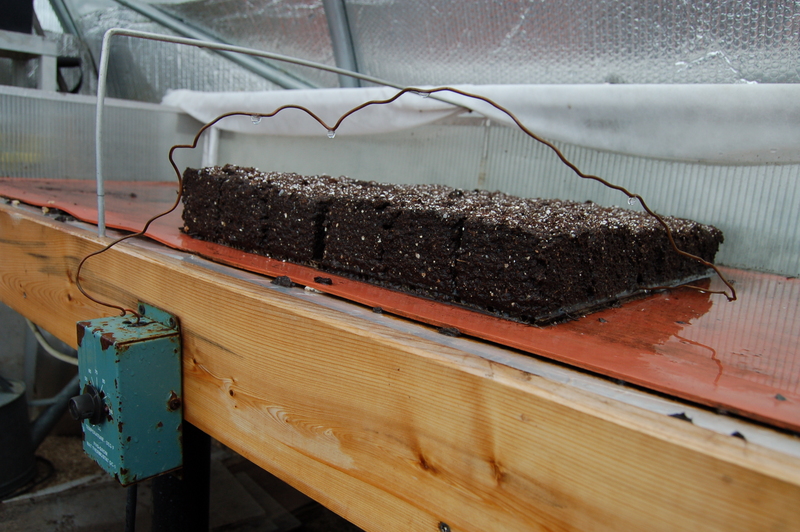 To see what we are talking about, check out this slide show of Eliot’s technique using soil block makers. 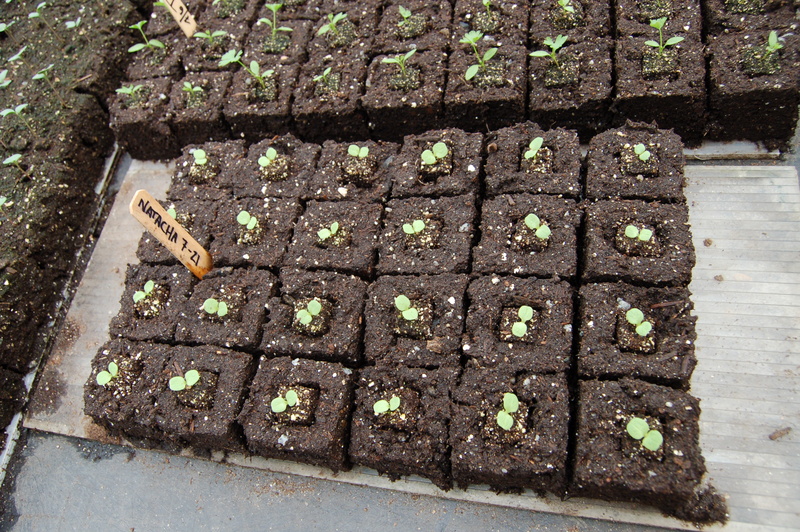 Notice the smalls transplants are inserted into the bigger soil blocks. This pro grow thermostat maintains the ideal soil temperature. We had been at Four Season Farm for about a day when we noticed something was missing. The nagging feeling finally disappeared once we came across a pile of sand filled bags: Row cover! Where was the row cover? Often held in place by sand bags, row cover helps “shield” plants from insect damage and cold temperatures. 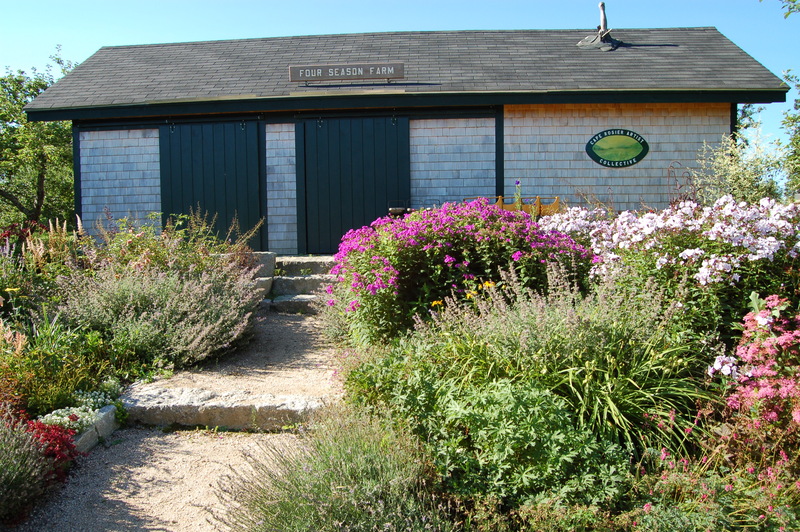 The Four Season Farm on-site store also serves as the Cape Rosier Artist Collective art gallery. We feel particularly fortunate to be writing this post for we know that many seasoned and aspiring farmers would love to visit Four Season Farm, home of Barbara Damrosch and Eliot Coleman. And if you don’t quite know why that is, simply visit a green thumb and take a peak at his or her library: it is likely you will find a few of the books written by Barbara and Eliot. With their lifelong dedication to organic farming and gardening, there is no doubt that Barbara and Eliot have, and will continue to, inspire and inform generations of gardeners and small-scale farmers. As you can imagine, it was a real treat to spend time with them and the Four Season team. We met the people and saw the place behind the books and delighted in both stories of how they started-Eliot purchased the 60 acre wooded property from Scott and Helen Nearing at $33 per acre and cleared it by hand-and where they are heading-ideas for new tools or systems are plentiful at Four Season Farm. Below is a glimpse of what we came across during our stay. 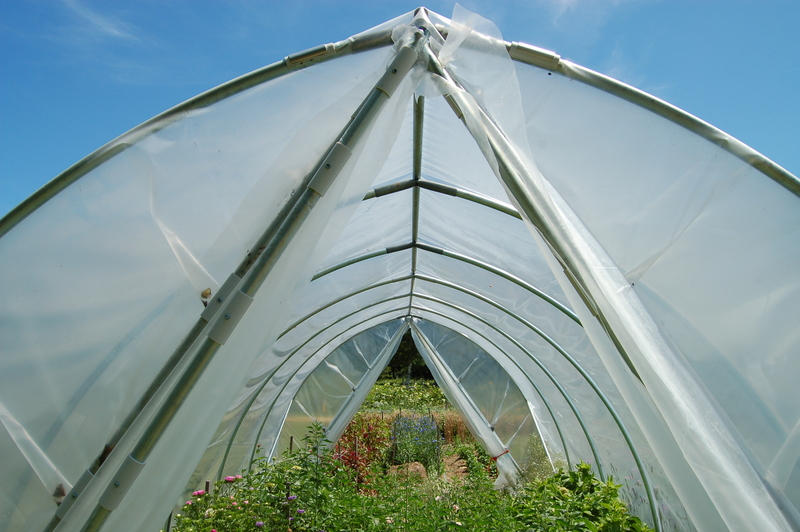 We came to know the tunnel shown above as the “$300 greenhouse”. These hoop benders are available from http://www.hoopbenders.net and Johnny's Seeds. Designed by the Four Season’s team, this small greenhouse can be assembled with materials found at any hardware store for the modest sum of approximately $300 (US, we should add). But here’s the trick: While it is not challenging to find the pipes to make the hoops, try bending those very pipes evenly with a home-made rig and you will understand the beauty of these hoop benders. Check out this video to see how they work. As for the greenhouse, Eliot mentioned that his upcoming book should include the detailed plan. 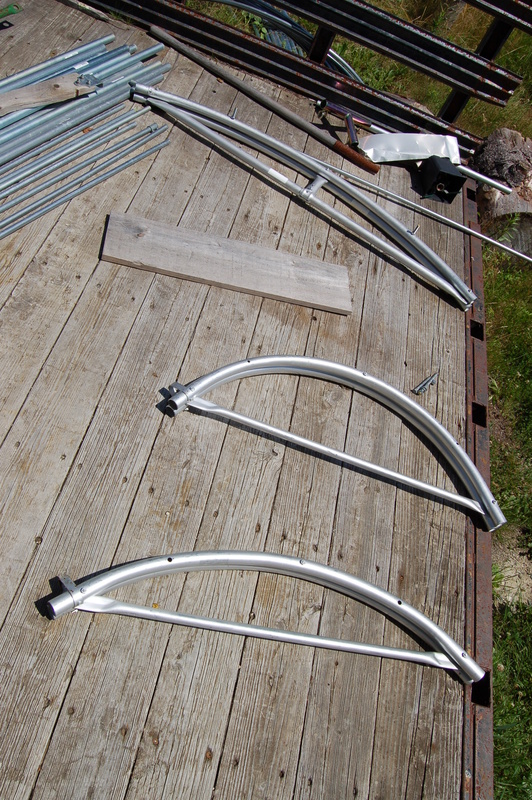 Meanwhile, we’ll be bending pipes! 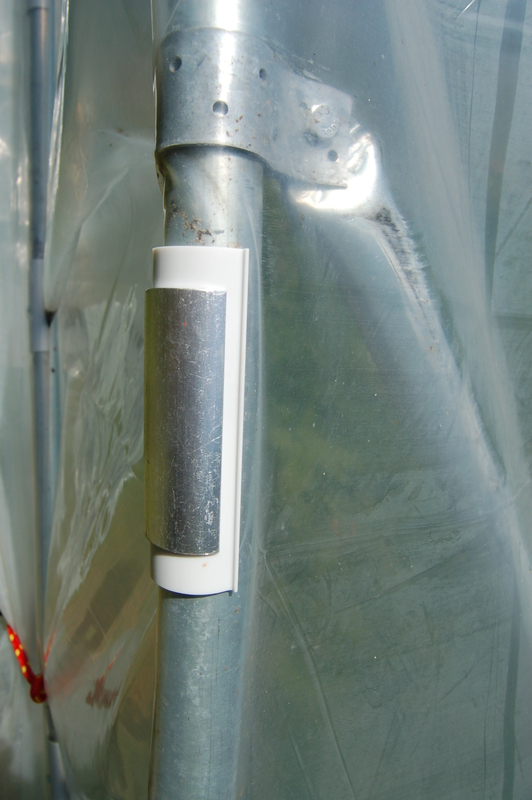 To secure and tighten the plastic onto the greenhouse, these home-made clamps are a cheap alternative to channel lock. A close up of the $300 greenhouse ''scissor doors''. 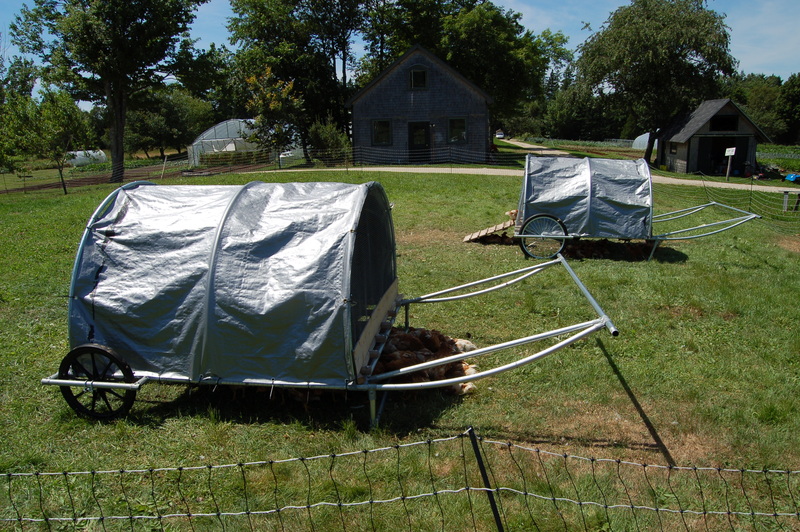 As shown above, the latest generation of Eliot's chicken tractor makes use of the hoop benders. 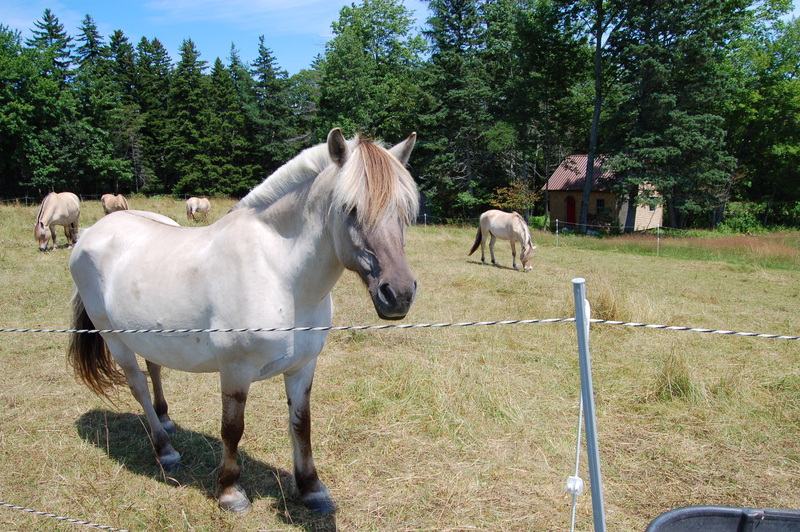 Heading south along the Maine coast, from Mandala Farm to Mount Desert Island, we arrived at Beech Hill Farm. 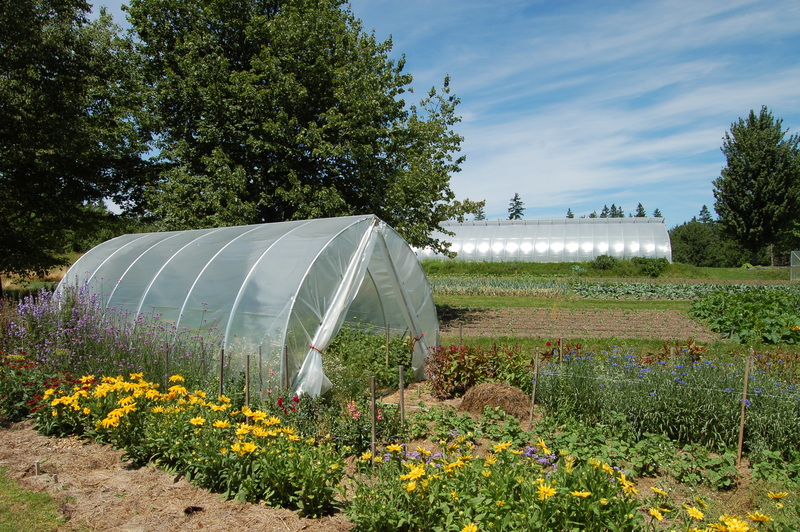 The farm consists of about 5 acres of organic vegetable production. Produce is retailed through an on-site farm stand that also carries many other locally produced goods, it is also sold to several restaurants on the island, offered through a seasonal box program, as well as sold to the college’s cafeteria. 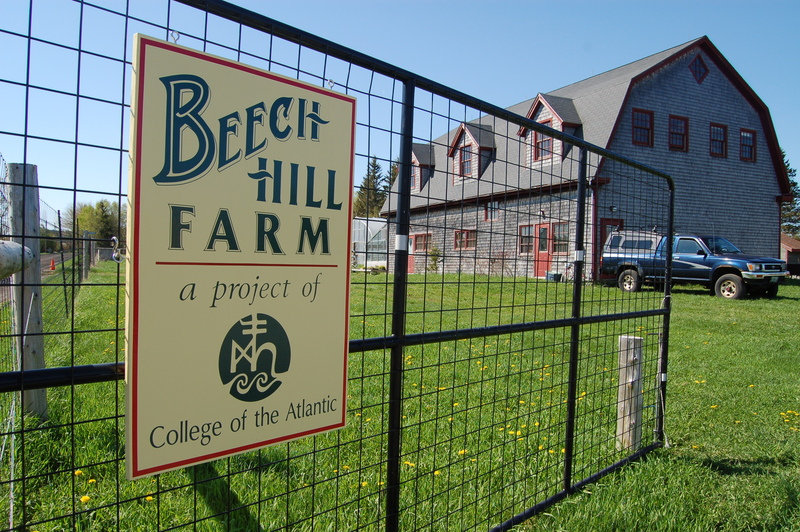 Virginie and I both had our formative farming experiences at Beech Hill several years ago when we were students at The College of the Atlantic (COA). 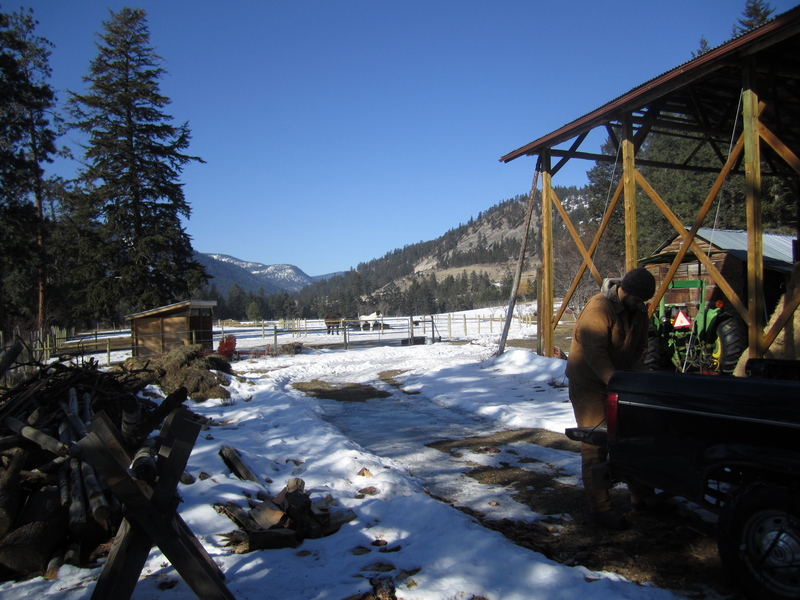 The farm has been owned and operated by the college since 1999 when it was donated by alumni. It gives students the opportunity to integrate hands-on agricultural work experience and research into their Human Ecology curriculum. After cycling 125km from Campobello Island, New Brunswick, to Gouldsboro, Maine, we were happy to land in a familiar landscape. Having spent four years living and studying at The College of the Atlantic (COA) in nearby Bar Harbor, Alex and I were looking forward to finally visit fellow COA alumns Genio Bertin and Sarah Faull’s Mandala Farm. We had enjoyed the food they produced (nothing like Mandala Farm bacon and eggs to fuel you through college!) and heard lots about them through friends who had apprenticed at the farm. About 10 pigs are raised for meat and piglet sales . 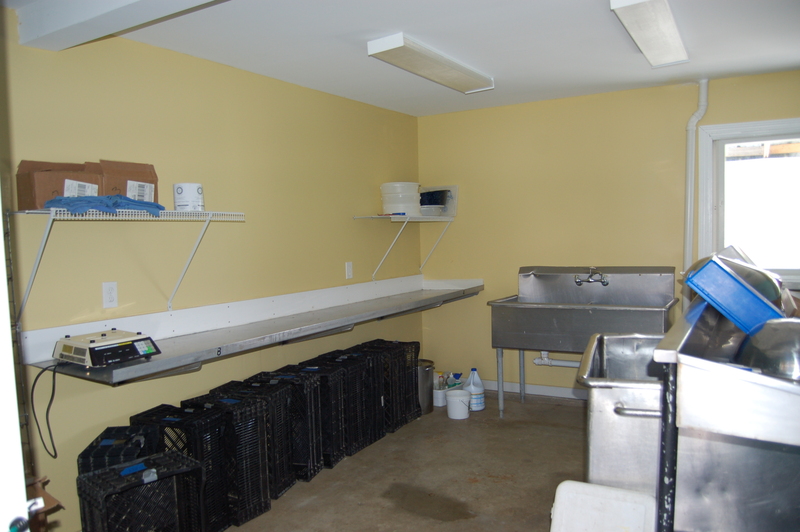 Genio and Sarah built their own on-site poultry processing facility, for which they are licensed to slaughter up to 20,000 birds per year. These days , slaughtering facilities are declining in numbers; we consider Genio and Sarah's initiative to be an important, admirable and visionary accomplishment . In the pictures above you can see the outdoor space where the birds are slaughtered and plucked. They are then passed through the window to be further processed in the indoor space.